Blue Mistress is chained to a visitors buoy in Falmouth. She’s fine there. I have been wrestling with the problem of taking photographs that show the true state of the sea and express the exhilaration of being under sail in strong winds. The challenge is that nothing keeps still, whether it be the photographer, the camera, the boat or the sea – all are moving in relation to each other. The perfect shot the eye sees is lost in an instant. There is an argument for video but that needs a more organised set-up. Hand-held, there is the problem of keeping the camera still for long enough; attached to the boat, the camera angle is fixed and the movement between the boat and the camera is lost. For this reason I prefer ‘still’ photography – ‘still’ is the wrong word here, of course. Both images were taken last Wednesday morning between Plymouth and Fowey. The distance was approximately 20 nautical miles. 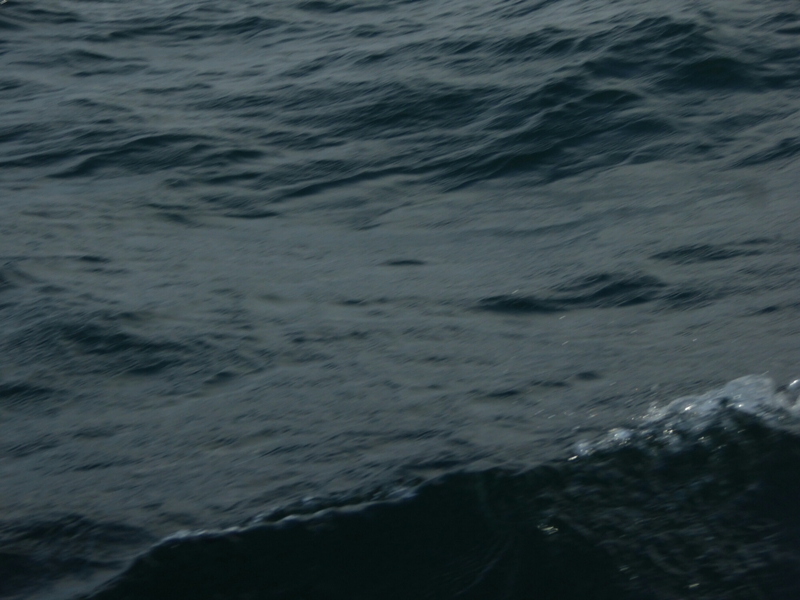 The wind was east to south east, force 5 to 6, the sea moderate. The tide was favourable. Blue Mistress was humming under reefed main and working foresail. She was the smallest of the few boats I saw that morning. I was hand-steering, the Windpilot is housed. Taking photographs was a snatched luxury – one hand for the boat, one for the tiller and one for the camera was not an option! 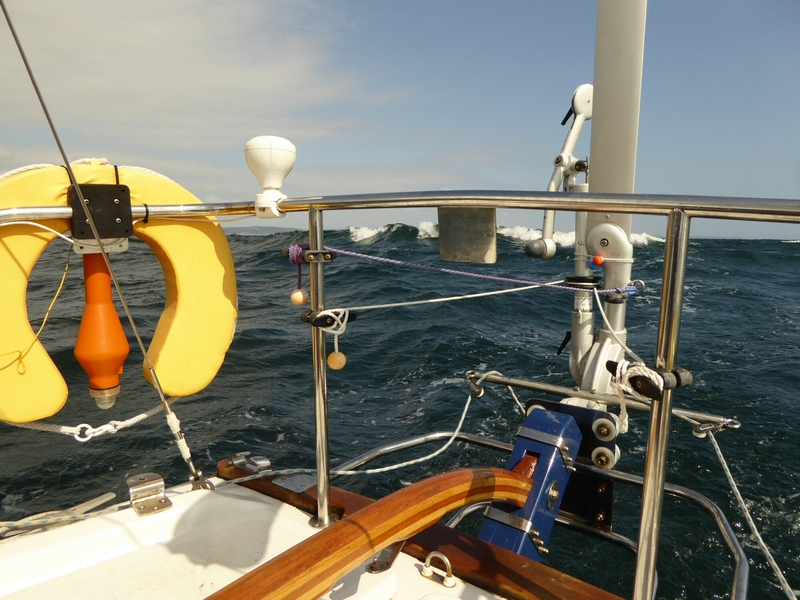 Later in the morning, we were still going downwind at approximately 6 knots. 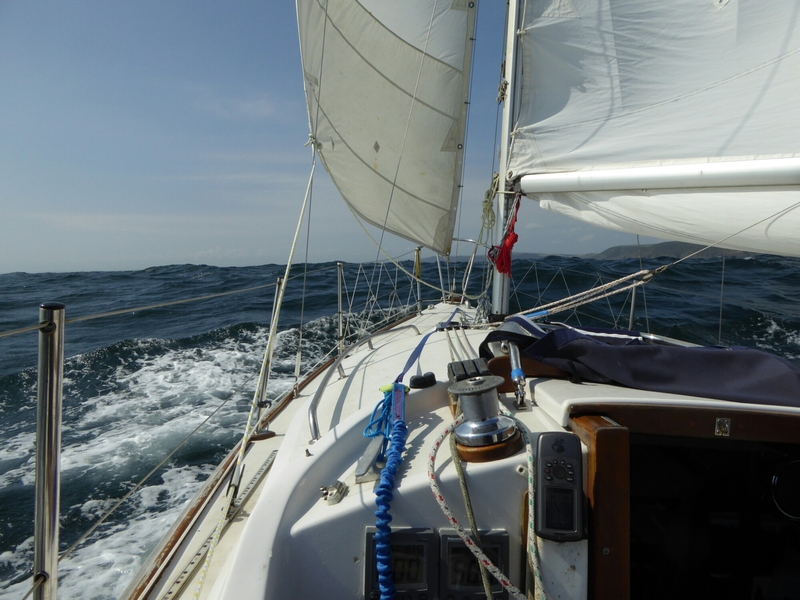 I decide to goose-wing, (have the foresail catching the wind on the opposite side of the boat to the mainsail). I am too slow in hauling in the windward foresheet and get the foresail wrapped around the forestay. Then the snap-shackle on the tack of the sail opens – (that’s never happened before; it must have hit the deck with enough force to open the button). 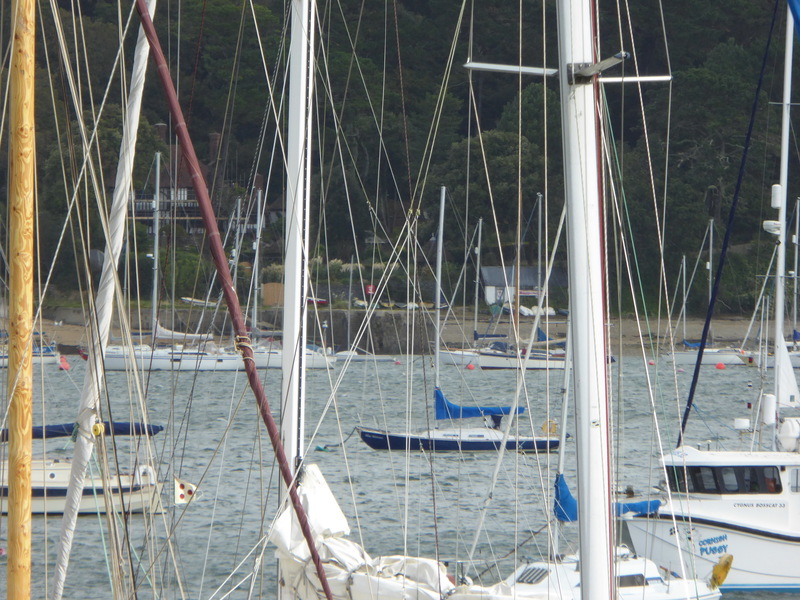 The sail, now detached from the deck, starts to slide up the stay. This is a don’t-just-sit-there-do-something moment before it gets out of reach. I release the mainsheet, the boat slows and turns to lie side-on to the wind and sea. I go forward, tethered to a jack-line – (I have them permanently attached to each of the two jack-lines). One moment the deck is coming up to meet me, the next it is leaving me suspended in mid-air. I grab the push-pit rail, kneel down, the immediately have to stand again to reach the flaying tack. Pulling it down, I find the sheets have wrapped twice round the forestay and I can’t bring the tack low enough to reattach it.I remember a length of line in my pocket and tie it temporarily before going aft to release the clutch holding the foresail halyard. I ease it a foot or so. Forward again, kneeling, braced against the push-pit, I manage to reattach the snap-shackle, then spend several minutes trying to untwist the sail from the stay. This was made easier because the sheets are also around the stay and I can haul the clew (the outer end of the sail) to me. That done, the sail is flagging to leeward but the sheets are not free, they are caught round the wire attaching the snap-shackle to the deck. I unshackle the tack, quickly free the sheets, reattach the snap-shackle, slide back along the jack-line to the safety of the cockpit – relax and look around. The boat is still lying side-on to the waves, the sheets are fully eased, the sails at right-angle to the boat. There is the cacophony of flagging sailcloth. 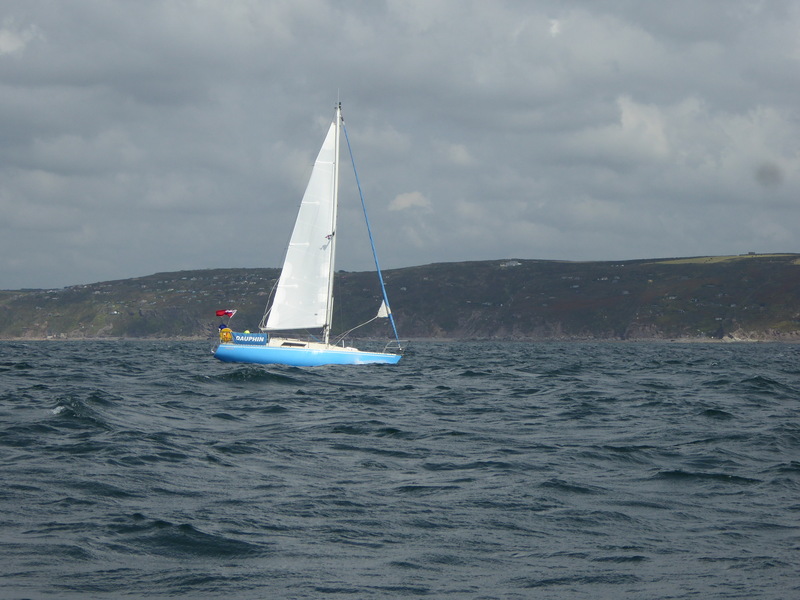 If I lowered the sails, which would be impossible without heading directly into the wind, we would be in ‘cork mode’. I would not have done this voluntarily on this passage but I have experienced something I have never had to do before – and have even more faith in my boat. The images now have more significance because of what happened before.